A good paint job goes a long way towards enhancing your commercial property's curb appeal and we're equipped to handle nearly any painting need you might have. Making a good first impression is crucial for any company, and your property plays a huge role in that impression. Employees also prefer to work in buildings that are attractive and well maintained. One of the most noticeable parts of any interior or exterior commercial property is always the paint job. 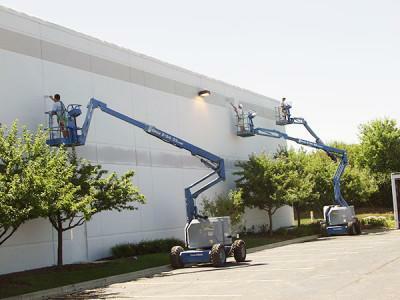 At MDF Painting & Power Washing we can work with you to make sure your commercial property has a beautiful paint job that enhances its appearance and appeal. Our expert team takes great pride in a reputation for excellence and an ability to match the diverse painting needs of commercial developers and municipal projects. Whatever your commercial painting needs, you can count on us to deliver the quality interior or exterior painting you need. Contact us today online or give us a call at 1-844-257-4559 and schedule your free estimate for commercial painting services in Greenwich, Stamford, Norwalk, and the surrounding areas of Connecticut! Help design the scope of the work and project specifications free of charge. Will show up on time every time. Make partnerships with our maintenance plans. Protect & beautify the property. Not only will a new paint job make the facility look nicer, but it also helps protect the property from rust, warping, rotting, buckling, and other forms of damage. We know your investments are too valuable to go unprotected. Provide professionalism & honesty. We've built a culture focused around honesty and have designed our operational systems to make sure we show up on time and deliver a consistent level of service. While mistakes are impossible to stop completely, we will own up to ours and correct them quickly and efficiently. Make the process stress-free. The last thing you want is for your commercial painter to be careless and disturb your work environment. At MDF Painting & Power Washing we strive to "paint like a ghost" and provide minimal disturbance to your environment and process. MDF Painting & Power Washing has worked with over 50 condominium complexes over the last 15 years! We implement specific maintenance plans for each complex which makes it easy for condominium associations and property managers to save money while still receiving the quality painting services that they need. At MDF Painting & Power Washing we're proud of our "Church Partnership Program" and make it our mission to serve Connecticut churches. With a wide range of quality options like exterior painting, epoxy flooring, pressure washing, and carpentry, we can meet your church's needs while fitting within your budget. Founded in 1987, Fine Paints of Europe provides the highest quality paints and personalized services to homeowners and professionals. Benjamin Moore manufactures their own resins and proprietary Gennex® colorants, which deliver superior performance and application in every product. Paired with their unmatched selection of colors, their products are formulated to help you achieve beautiful, lasting results when painting your home. Benjamin Moore offers a wide selection of high-quality interior and exterior paints. We will help you select the best type of paint and color for your home and provide expert application. Aura® Interior Paint: Aura Interior with our exclusive Color Lock technology delivers the ultimate performance for brilliant, rich, and everlasting color. Aura® Bath And Spa Paint: Aura Bath & Spa is a luxurious matte finish designed for high-humidity environments. Natura® Paint: Natura Waterborne Interior Paint is Benjamin Moore's greenest paint. Regal® Select Interior Paint: Regal Select Interior has been a trusted brand for more than 50 years and is formulated for easy cleaning in a wide variety of sheens. ben® Interior Paint: ben Interior is user-friendly paint for flawless results and puts premium color within reach. ADVANCE® Interior Paint: A premium quality, waterborne alkyd paint that offers a full line of durable high-end finishes ideal for doors, trim and cabinetry. Aura® Exterior Paint: Aura Exterior with our exclusive Color Lock technology provides the ultimate performance for rich, full color and unprecedented durability. Aura® Grand Entrance®: Aura Grand Entrance brings rich, vivid color and exceptional durability to your interior/exterior doors and trim. Regal® Select Exterior Paint: Regal Select Exterior adheres beautifully to hard-to-coat surfaces creating a durable, robust finish. Regal® Select Exterior High Build Paint: Regal Select Exterior High Build offers optimum coverage for added protection and durability in fewer coats. Regal® Select Exterior REVIVE® for Vinyl Siding: Regal Select REVIVE is specially formulated for optimal performance on vinyl siding and trim, for a fresh look in a wide range of colors. ben® Exterior Paint: ben Exterior is user-friendly paint for flawless results and beautiful transformations. California Paints is a part of ICP's Building Solutions Group, which is a compilation of industry-leading brands delivering incredible home improvement products. California Paints specialize in providing a diverse range of beautiful interior paints, exterior paints, and architectural coatings. PPG Paints combines the PPG Pittsburgh Paints®, PPG Porter Paints®, and Glidden Professional® brands into one company. This combined entity continues PPG's legacy of providing quality paints and stains for well over 100 years. Get started on your commercial painting project today with a free estimate! You can't risk a sub-par paint job on your commercial property. Luckily, MDF Painting & Power Washing has the experience and expertise that you need to ensure your commercial painting project goes smoothly. Give us a call today at 1-844-257-4559 or contact us online to schedule your free estimate on any of our commercial painting options for your facility, condo, or other commercial property. We offer all our painting services throughout Greenwich, Stamford, Norwalk, Westport, Fairfield, Darien, New Canaan, Trumbull, Milford, Wilton, and nearby.